So, the time has come. Time to begin my journey with the Dillon Panthers and Coach Taylor. I haven't watched a drama in a long time. Probably not since I quit One Tree Hill after that whole Nanny Carrie debacle. But after hearing Knox interject analysis and/or praise for Friday Night Lights at any slight opportunity in the TV Asylum podcast, I figured I ought to give this thing a shot. It's summer, y'know? What have I got to lose? So we've restarted Netflix (after canceling it months ago due to its abysmal movie-streaming selection and the fact that we had DVR) and taken on Parks and Rec (season 2 and forward, more on that later) along with FNL*. I've watched a total of three episodes so far. And since most people in the TVA community have probably already been through FNL, I thought I'd take some time to remind you what it was like to experience it for the very first time. Y'know, remind you of the good ol' days. 2) FNL doesn't ease you in to its story. It doesn't utilize the first few episodes to introduce you to the characters, setting or otherwise. They're not gradually adding layers to characters. The layers are already all present. We're just catching glimpses of the layers, and I'm sure as the series goes on, we'll get longer glimpses to piece together. It's like FNL simply drops you into a world that has already existed and will continue to exist after you leave it. Your watching it doesn't determine its existence. It's unaware it's just a TV show. Did I just get super deep? I think I just got super deep. Anyway, to me FNL has been like moving to a foreign country speaking about 6 words of the language and having to pick it up really quickly in order to function. But I hear that's the best and quickest way to learn. Being lowered down into the chaos and trying to make sense of it. In no way am I saying this is a bad thing. I like it, actually. It's challenging. They're not waiting around for me to figure it out. I'm having to figure it out on my own, so I have to pay attention. 3) I'm a huge fan of Mrs. Coach. HUGE. Why? She's surrounded by the stereotypical southern fake-nice-syndrome book clubbers/committee members, yet she maintains her normalcy. She gets it. She's genuine. She knows these people are ridiculous, but she maintains her class. I want to be her friend and I want to punch the other ladies in the face just for existing. I'm also a huge fan of Riggins already, and I have no idea why. How did they do that? He's this totally lazy drunkard "bad boy" kid. On paper he should repulse me. He probably would in real life. But I still like this guy. I got that he was simply misunderstood and had a hard life right from the get-go. I don't know how they conveyed that, but they did. And I'm a fan. 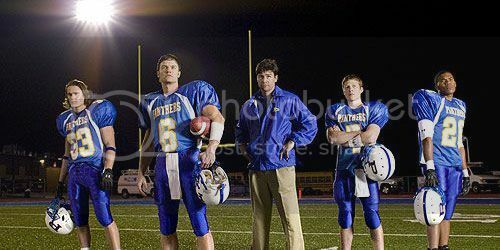 Who's your favorite FNL Character? *Side note: I typed "SNL" by accident every single time I tried to type "FNL." This is going to take some getting used to.